The Motorola Moto G7 is a mid-range Android smartphone and the successor to the Moto G6 (Review). The smartphone brings a major change in its front design, featuring a waterdrop notch. Based on Android 9 Pie, the Moto G7 features a 6.2-inch Full HD+ IPS LCD screen. It is powered by the Snapdragon 632 octa-core processor, paired with 4GB of RAM and 64GB of onboard storage. It features a 12MP+5MP dual-camera at the rear and an 8MP selfie camera. The Moto G7 has a 3,000mAh battery with support for fast charging. The Motorola Moto G7 price in India is Rs 16,999 for the 4GB + 64GB internal storage variant. The phone is available in 2 variants: White, Black. The phone was launched in India on 30 April 2019. The Moto G6 saw Motorola move from a 16:9 screen to a taller screen with 18:9 aspect ratio. 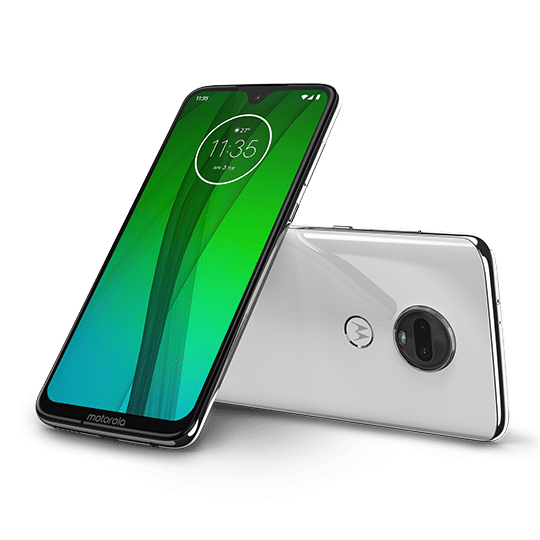 With the Moto G7, the now-Lenovo-owned company has increased the screen-to-body ratio even further (to 19:9) by moving to a larger and taller screen. The display bears a waterdrop notch at the top-middle portion accommodating the front-facing camera as well as the earpiece. Corning’s Gorilla Glass 3 panel covers the entire front part of the Moto G7. At the rear, the Moto G7 has a circular dual-camera assembly, featuring the dual-LED flash and a surprised minion-like face. A glass panel covers the back with rounded corners. There is a fingerprint sensor on the rear, hidden inside the Motorola logo. The power and volume buttons on the right side leaving the left side completely devoid of any slots or buttons. The microSD and SIM card slot are at the top while the speaker grill, USB Type-C port, and the 3.5mm headphone jack are placed at the bottom of the Moto G7. 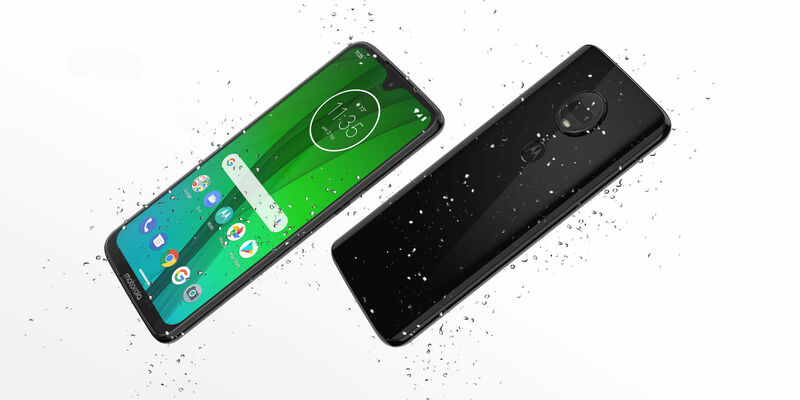 The phone is also resistant to dust and water splashes, similar to that of the Moto G6. Similar to the Moto G6, the Moto G7 has a 12MP+5MP dual rear camera setup. The 12P sensor features f/1.8 aperture, 1.25µm pixels, PDAF, and 4K video recording at 30fps. The 5MP depth sensor unit which has f/2.2 aperture and allows the Moto G7 to capture still images with background blur effect (commonly known as Bokeh). 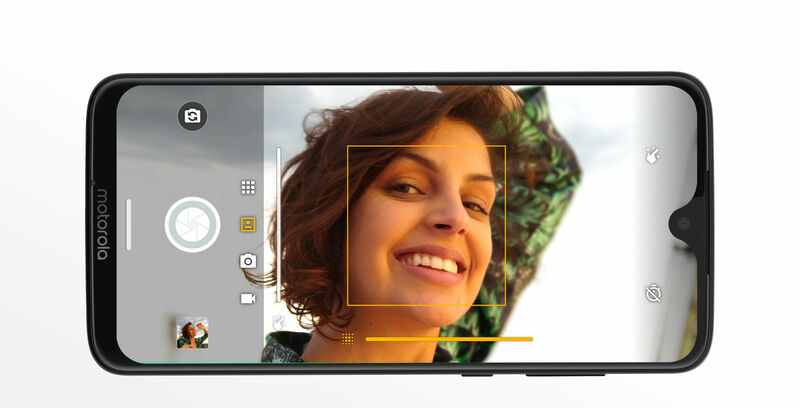 On the front, the Moto G7 packs an 8MP selfie snapper with 1080p video recording and Face Unlock feature. Motorola has equipped the Moto G7 with a 3,000mAh battery supporting fast charging (at 15W Turbo Charge). The company also bundles a compatible Turbo Charger inside the phone’s box so that you won’t have to buy it separately. While not as fast as Quick Charge 3.0 or Dash Charge, it’s still better than all the 2018 iPhones that come bundled with measly 5W chargers.